Ruler Templates, what are those things? Come learn all about them and what you can do with them! This ruler template class is for the domestic machine quilter who would like to take their quilting to a new level of design using the increasing popular ruler templates for domestic or sit down machine quilting. Ruler work is fun once the techniques are mastered. 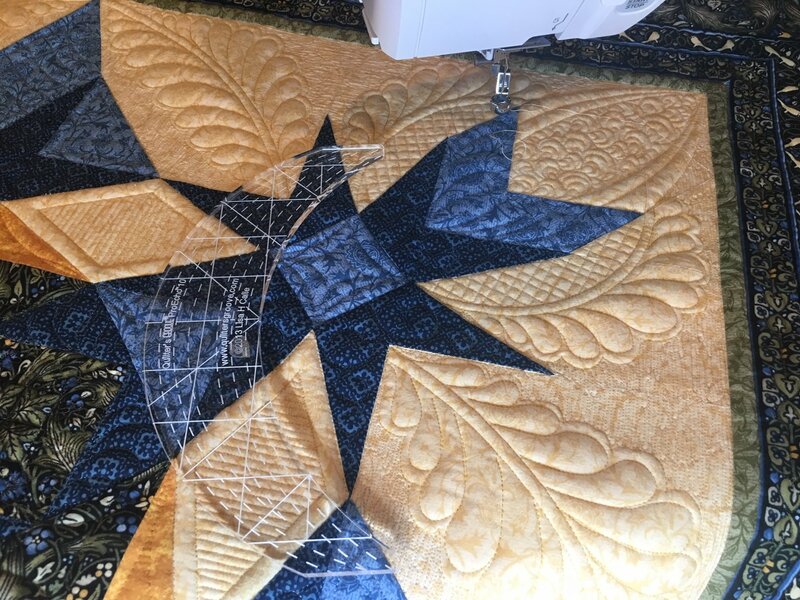 This class is designed to help each student learn the techniques that works for their particular machine, quilting style and design ambitions. Click here to download the class Supply List. In 2005, Cathryn signed up for a block of the month quilt at a local quilt store. Needing a way to finish the project, she bought a Gammill LongArm and unexpectedly uncovered a new passion. She spent the next 9 years transitioning from her technical engineering background to becoming a quilter with focus on her detailed machine quilting. In 2014 she retired and became involved in her surrounding quilting community. She started showing her quilts in local shows and has been blessed to win ribbons for each of them. It has been a rewarding journey as there is always a new technique, a spin on an old technique, a new tool, both long arm rulers and domestic ruler templates. She can?t resist trying any of them and now enjoys sharing her passion for machine quilting techniques with others through teaching.